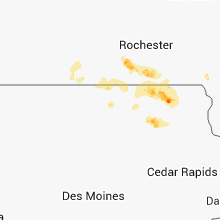 The Sargeant, MN area has had 1 report of on-the-ground hail by trained spotters, and has been under severe weather warnings 18 times during the past 12 months. 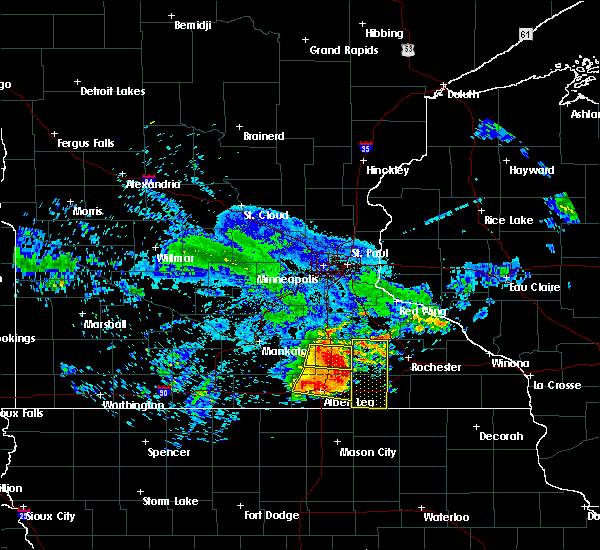 Doppler radar has detected hail at or near Sargeant, MN on 30 occasions, including 3 occasions during the past year. 9/20/2018 7:08 PM CDT At 653 pm cdt, severe thunderstorms were located along a line extending from 6 miles northeast of kenyon to near northwood, moving east at 65 mph (trained weather spotters. 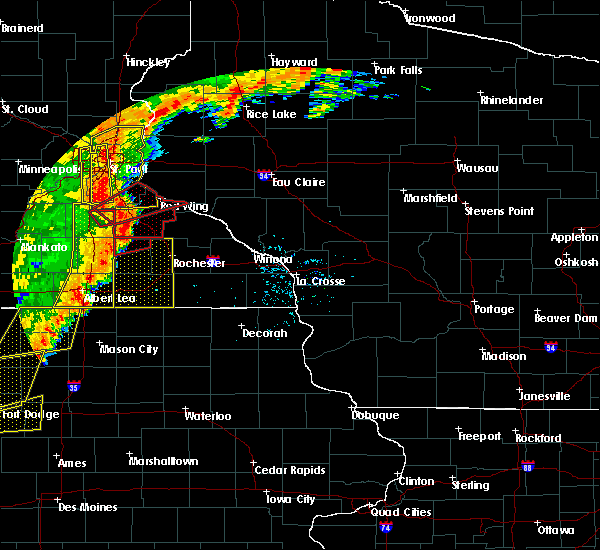 spotters and airport wind equipment have recorded 60 to 70 mph winds with this line of storms. brief tornadoes have also been confirmed). Hazards include 70 mph wind gusts. Expect considerable tree damage. damage is likely to mobile homes, roofs, and outbuildings. these severe storms will be near, rose creek around 715 pm cdt. adams around 720 pm cdt. le roy and grand meadow around 730 pm cdt. western rochester around 720 pm. other locations impacted by these severe thunderstorms include high forest, lansing, wasioja, douglas and rock dell. A tornado watch remains in effect until midnight cdt for north central and northeastern iowa, and southeastern minnesota. 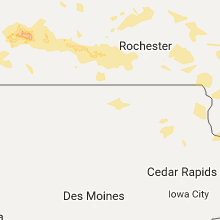 9/20/2018 6:55 PM CDT At 653 pm cdt, severe thunderstorms were located along a line extending from 6 miles northeast of kenyon to near northwood, moving east at 65 mph (trained weather spotters. 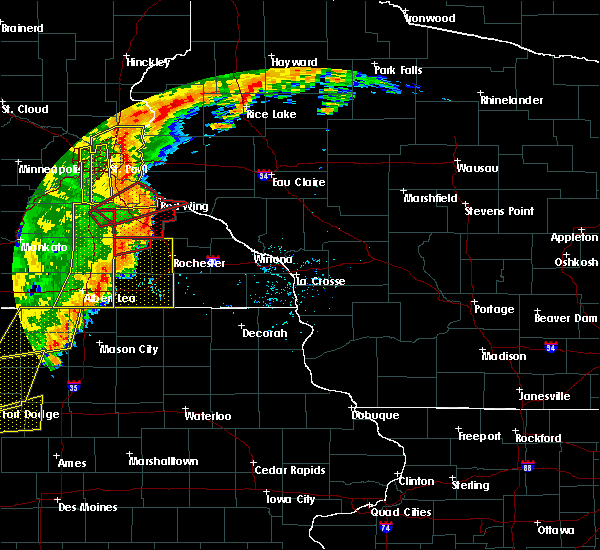 spotters and airport wind equipment have recorded 60 to 70 mph winds with this line of storms. brief tornadoes have also been confirmed). Hazards include 70 mph wind gusts. Expect considerable tree damage. damage is likely to mobile homes, roofs, and outbuildings. these severe storms will be near, rose creek around 715 pm cdt. adams around 720 pm cdt. le roy and grand meadow around 730 pm cdt. western rochester around 720 pm. other locations impacted by these severe thunderstorms include high forest, lansing, wasioja, douglas and rock dell. A tornado watch remains in effect until midnight cdt for north central and northeastern iowa, and southeastern minnesota. 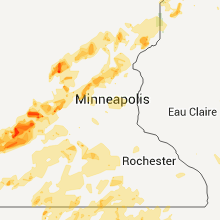 9/20/2018 6:38 PM CDT At 636 pm cdt, severe thunderstorms were located along a line extending from near faribault to lake mills, moving east at 65 mph (trained spotters. the storms have a history of producing 60 to 70 mph winds and brief damaging tornadoes). Hazards include 70 mph wind gusts. Expect considerable tree damage. damage is likely to mobile homes, roofs, and outbuildings. severe thunderstorms will be near, lyle around 705 pm cdt. rose creek around 710 pm cdt. adams around 715 pm cdt. le roy and grand meadow around 725 pm cdt. western side of the city of rochester around 720 pm. other locations impacted by these severe thunderstorms include high forest, lansing, wasioja, douglas and rock dell. A tornado watch remains in effect until midnight cdt for north central and northeastern iowa, and southeastern minnesota. 8/27/2018 6:10 PM CDT The severe thunderstorm warning for western olmsted, mower and eastern dodge counties will expire at 615 pm cdt, the storms which prompted the warning have moved out of the area. therefore the warning will be allowed to expire. however gusty winds and heavy rain are still possible with these thunderstorms. 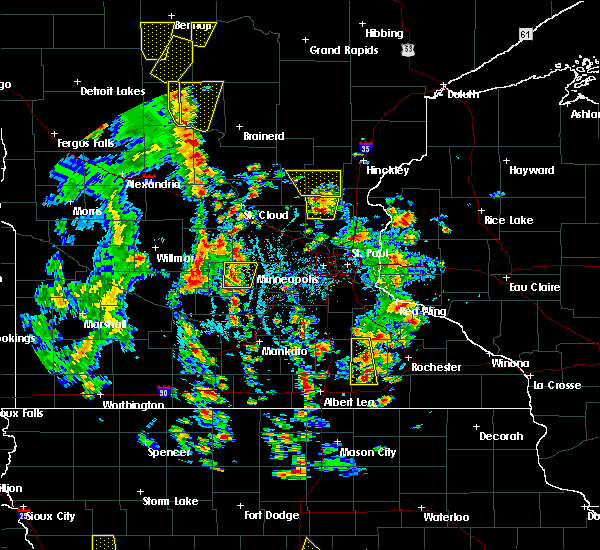 a severe thunderstorm watch remains in effect until 1000 pm cdt for southeastern minnesota. remember, a severe thunderstorm warning still remains in effect for eastern olmsted and southeast mower counties until 645 pm!. 8/27/2018 5:52 PM CDT At 551 pm cdt, severe thunderstorms were located along a line extending from near mazeppa to near stewartville to lyle, moving east at 35 mph. these storms have produced winds of 45 to 55 mph (radar indicated). Hazards include 60 mph wind gusts. Expect damage to roofs, siding, and trees. these severe storms will be near, oronoco and byron around 555 pm cdt. 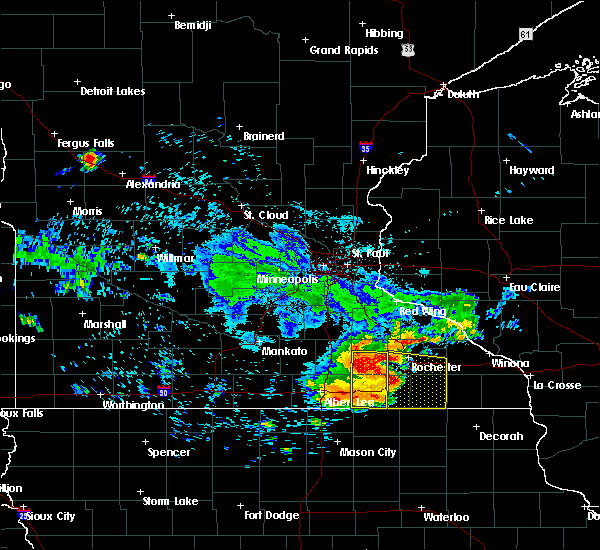 rochester and stewartville around 600 pm cdt. Other locations impacted by these severe thunderstorms include high forest, lansing, douglas, rock dell and mayville. 8/27/2018 5:31 PM CDT At 530 pm cdt, severe thunderstorms were located along a line extending from 6 miles south of wanamingo to hayfield to near northwood, moving east at 45 mph (radar indicated). Hazards include 60 mph wind gusts. Expect damage to roofs, siding, and trees. these severe storms will be near, mantorville, dodge center, hayfield and west concord around 535 pm cdt. 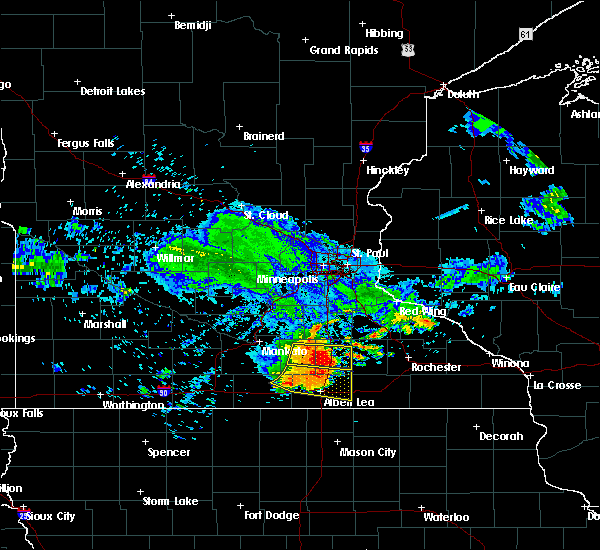 kasson around 540 pm cdt. oronoco and byron around 545 pm cdt. stewartville around 550 pm cdt. rochester and rose creek around 555 pm cdt. Other locations impacted by these severe thunderstorms include high forest, lansing, wasioja, douglas and rock dell. 8/27/2018 5:09 PM CDT At 509 pm cdt, severe thunderstorms were located along a line extending from near medford to near hollandale to 6 miles northeast of rice lake, moving east at 35 mph (radar indicated). Hazards include 60 mph wind gusts and penny size hail. Expect damage to roofs, siding, and trees. 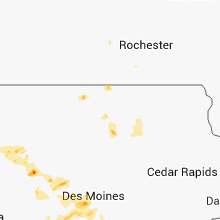 Locations impacted include, rochester, austin, dodge center, mantorville, kasson, stewartville, byron, hayfield, oronoco, west concord, brownsdale, lyle, claremont, rose creek, high forest, lansing, wasioja, douglas, rock dell and concord. 7/4/2018 2:43 PM CDT At 242 pm cdt, severe thunderstorms were located along a line extending from near stewartville to near lyle, moving east at 30 mph (radar indicated). Hazards include 60 mph wind gusts. Expect damage to roofs, siding, and trees. 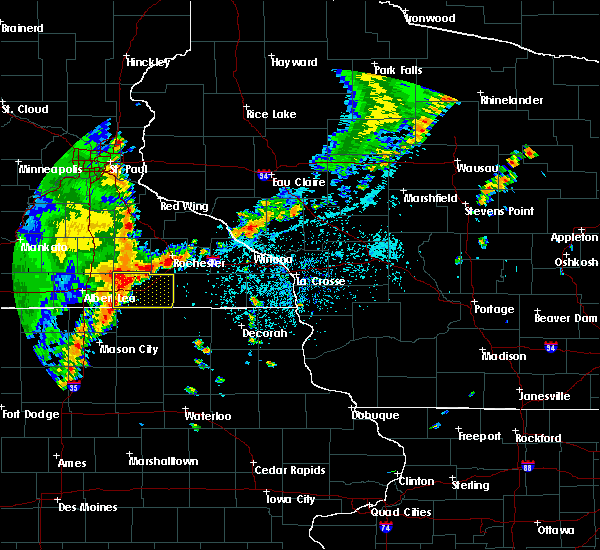 these severe storms will be near, grand meadow around 250 pm cdt. le roy around 315 pm cdt. Other locations impacted by these severe thunderstorms include lansing, racine, mayville, dexter and mapleview. 7/4/2018 2:31 PM CDT At 231 pm cdt, severe thunderstorms were located along a line extending from 8 miles southeast of hayfield to lyle, moving east at 30 mph (radar indicated). Hazards include 60 mph wind gusts. Expect damage to roofs, siding, and trees. 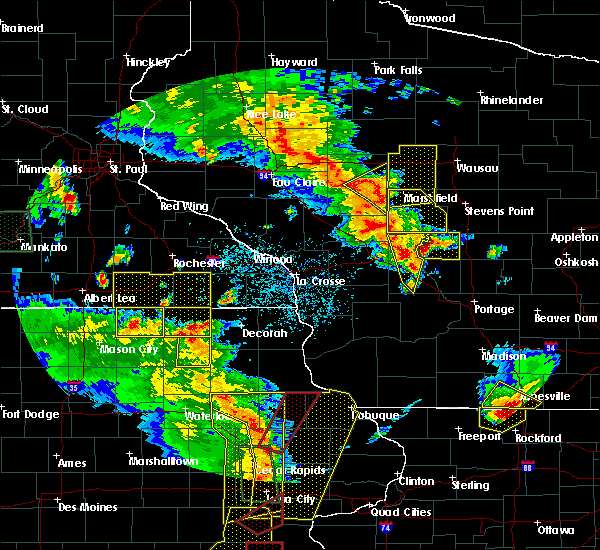 these severe storms will be near, grand meadow around 245 pm cdt. adams around 255 pm cdt. le roy around 315 pm cdt. Other locations impacted by these severe thunderstorms include lansing, racine, mayville, dexter and mapleview. 7/4/2018 2:22 PM CDT At 222 pm cdt, severe thunderstorms were located along a line extending from near hayfield to lyle, moving east at 40 mph (radar indicated). Hazards include 60 mph wind gusts. Expect damage to roofs, siding, and trees. these severe storms will be near, rose creek around 235 pm cdt. adams and grand meadow around 240 pm cdt. le roy around 255 pm cdt. Other locations impacted by these severe thunderstorms include lansing, racine, mayville, dexter and mapleview. 7/4/2018 2:18 PM CDT At 218 pm cdt, severe thunderstorms were located along a line extending from near hayfield to near lyle, moving east at 40 mph (radar indicated). Hazards include 60 mph wind gusts. Expect damage to roofs, siding, and trees. these severe storms will be near, rose creek around 235 pm cdt. adams and grand meadow around 240 pm cdt. le roy around 255 pm cdt. Other locations impacted by these severe thunderstorms include lansing, racine, mayville, dexter and mapleview. 7/4/2018 2:13 PM CDT At 213 pm cdt, severe thunderstorms were located along a line extending from near blooming prairie to near northwood, moving east at 25 mph (radar indicated). Hazards include 60 mph wind gusts. Expect damage to roofs, siding, and trees. severe thunderstorms will be near, austin around 220 pm cdt. brownsdale around 230 pm cdt. lyle around 240 pm cdt. rose creek around 255 pm cdt. adams and grand meadow around 310 pm cdt. le roy around 315 pm cdt. Other locations impacted by these severe thunderstorms include lansing, racine, mayville, dexter and mapleview. 6/30/2018 6:46 PM CDT At 645 pm cdt, severe thunderstorms were located along a line extending from near stewartville to near spring valley to le roy, moving east at 50 mph (radar indicated). Hazards include 70 mph wind gusts. Expect considerable tree damage. damage is likely to mobile homes, roofs, and outbuildings. these severe storms will be near, spring valley around 650 pm cdt. wykoff around 655 pm cdt. fountain and chatfield around 705 pm cdt. Other locations impacted by these severe thunderstorms include fillmore, high forest, pleasant grove, washington and rock dell. 6/30/2018 6:35 PM CDT At 634 pm cdt, severe thunderstorms were located along a line extending from near hayfield to 6 miles west of grand meadow to near stacyville, moving east at 45 mph (emergency management. 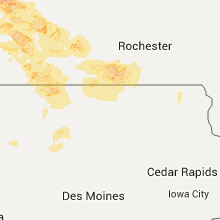 numerous reports of trees down have been received across western mower county). Hazards include 60 mph wind gusts. Expect damage to roofs, siding, and trees. 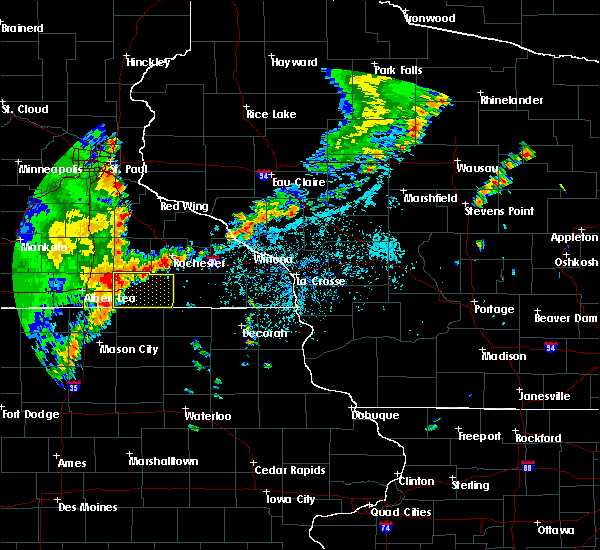 severe thunderstorms will be near, grand meadow around 645 pm cdt. 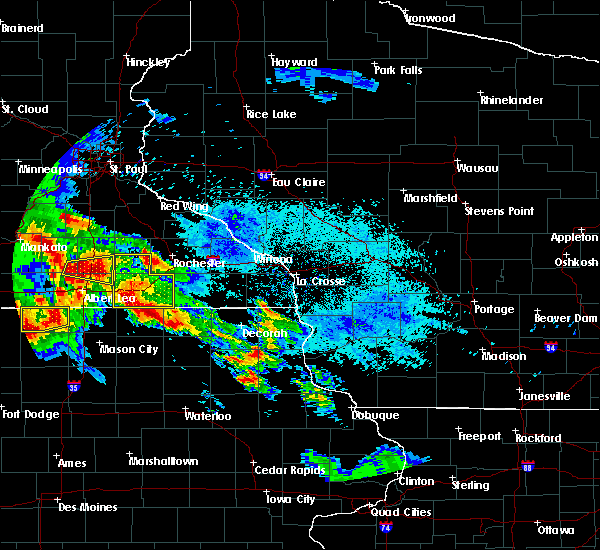 rochester and le roy around 650 pm cdt. spring valley and stewartville around 655 pm cdt. wykoff around 705 pm cdt. chatfield and fountain around 715 pm cdt. other locations impacted by these severe thunderstorms include fillmore, high forest, lansing, pleasant grove and washington. In addition to damaging winds, torrential rainfall will likely cause some flooding as these storms cross the area, particularly in urban areas. 5/29/2018 4:24 PM CDT At 424 pm cdt, a severe thunderstorm was located near brownsdale, or near austin, moving north at 25 mph (radar indicated). Hazards include 60 mph wind gusts and quarter size hail. Hail damage to vehicles is expected. expect wind damage to roofs, siding, and trees. This severe thunderstorm will remain over mainly rural areas of northwestern mower and southwestern dodge counties, including the following locations: lansing, mayville, waltham, sargeant and county roads 1 and 15. 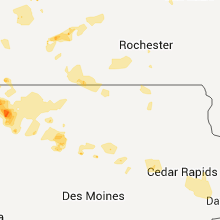 5/29/2018 4:08 PM CDT At 408 pm cdt, a severe thunderstorm was located over claremont, or 7 miles west of dodge center, moving north at 35 mph (radar indicated). Hazards include 60 mph wind gusts and quarter size hail. Hail damage to vehicles is expected. expect wind damage to roofs, siding, and trees. this severe storm will be near, west concord around 420 pm cdt. Other locations impacted by this severe thunderstorm include lansing, mayville, eden, waltham and sargeant. 5/29/2018 3:48 PM CDT At 347 pm cdt, a severe thunderstorm was located near hayfield, or 7 miles southwest of dodge center, moving northwest at 20 mph (radar indicated). Hazards include 60 mph wind gusts and half dollar size hail. Hail damage to vehicles is expected. expect wind damage to roofs, siding, and trees. this severe thunderstorm will be near, dodge center around 405 pm cdt. claremont around 415 pm cdt. west concord around 430 pm cdt. Other locations impacted by this severe thunderstorm include lansing, mayville, eden, waltham and sargeant. 7/19/2017 5:01 PM CDT At 459 pm cdt, severe thunderstorms were located along a line extending from 6 miles southwest of elgin to near stacyville, moving southeast at 40 mph (trained weather spotters report many pockets of wind damage and power outages. many reports of 50 to 70 mph wind have been received). Hazards include 70 mph wind gusts. Expect considerable tree damage. damage is likely to mobile homes, roofs, and outbuildings. 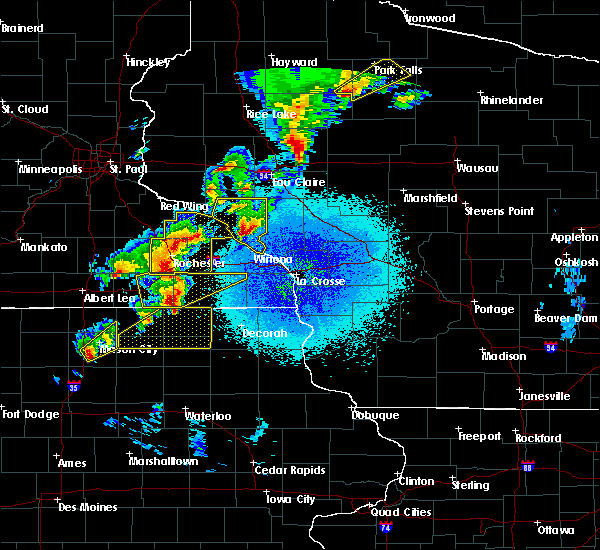 these severe storms will be near, le roy around 515 pm cdt. other locations impacted by these severe thunderstorms include high forest, lansing, wasioja, douglas and rock dell. People attending the dodge county free fair should seek safe shelter immediately!. 7/19/2017 4:34 PM CDT At 433 pm cdt, severe thunderstorms were located along a line extending from near west concord to near brownsdale to near northwood, moving east at 50 mph (trained weather spotters have reported 60 to 65 mph winds with this line of storms). Hazards include 70 mph wind gusts. Expect considerable tree damage. damage is likely to mobile homes, roofs, and outbuildings. 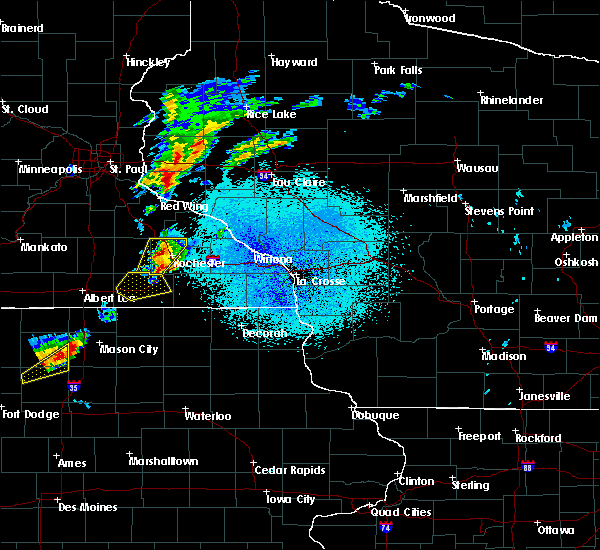 these severe storms will be near, mantorville, dodge center, brownsdale and kasson around 440 pm cdt. pine island around 445 pm cdt. byron around 450 pm cdt. oronoco and lyle around 455 pm cdt. 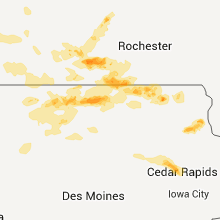 rochester, grand meadow and stewartville around 500 pm cdt. other locations impacted by these severe thunderstorms include high forest, lansing, wasioja, douglas and rock dell. People attending the dodge county free fair should seek safe shelter immediately!. 7/19/2017 4:32 PM CDT At 430 pm cdt, severe thunderstorms were located along a line extending from west concord to near blooming prairie to near northwood, moving east at 50 mph (trained weather spotters reported 60-65 mph winds west of dodge county). Hazards include 70 mph wind gusts. Expect considerable tree damage. damage is likely to mobile homes, roofs, and outbuildings. these severe storms will be near, dodge center, austin, west concord and ramsey around 435 pm cdt. mantorville, brownsdale and kasson around 440 pm cdt. byron and pine island around 445 pm cdt. oronoco around 450 pm cdt. rochester, grand meadow and lyle around 455 pm cdt. le roy around 515 pm cdt. other locations impacted by these severe thunderstorms include high forest, lansing, wasioja, douglas and rock dell. People attending the dodge county free fair should seek safe shelter immediately!. 7/19/2017 4:15 PM CDT At 412 pm cdt, severe thunderstorms were located along a line extending from near medford to near geneva to near mansfield, moving east at 60 mph (trained weather spotters. wind gusts of 60 to 65 mph and downed trees have been reported near interstate 35 with these storms). Hazards include 70 mph wind gusts. Expect considerable tree damage. damage is likely to mobile homes, roofs, and outbuildings. severe thunderstorms will be near, claremont around 425 pm cdt. austin, dodge center around 430 pm cdt. mantorville and hayfield around 435 pm cdt. byron and pine island around 440 pm cdt. oronoco around 445 pm cdt. rochester around 450 pm cdt. People attending the dodge county free fair should seek safe shelter immediately!. 6/12/2017 1:48 PM CDT At 148 pm cdt, a severe thunderstorm was located near hayfield, or 10 miles southeast of dodge center, moving northeast at 20 mph (radar indicated). Hazards include 60 mph wind gusts and quarter size hail. Hail damage to vehicles is expected. expect wind damage to roofs, siding, and trees. This severe thunderstorm will remain over mainly rural areas of southwestern olmsted, north central mower and southeastern dodge counties, including the following locations: rock dell, oslo, sargeant, county roads 1 and 7 and county roads 3 and 108. 6/12/2017 1:31 PM CDT At 131 pm cdt, a severe thunderstorm was located near hayfield, or 11 miles south of dodge center, moving northeast at 25 mph (radar indicated). Hazards include 60 mph wind gusts and quarter size hail. Hail damage to vehicles is expected. expect wind damage to roofs, siding, and trees. this severe thunderstorm will be near, kasson around 200 pm cdt. mantorville around 205 pm cdt. byron around 210 pm cdt. rochester around 215 pm cdt. Other locations impacted by this severe thunderstorm include rock dell, oslo, waltham, sargeant and county roads 3 and 108. 5/17/2017 7:10 PM CDT The severe thunderstorm warning for mower and western fillmore counties will expire at 715 pm cdt, the storms which prompted the warning have moved out of the area. therefore the warning will be allowed to expire. 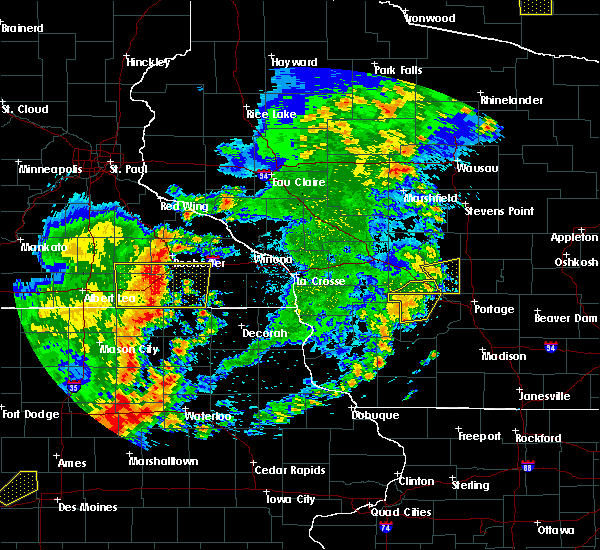 a tornado watch remains in effect until 1100 pm cdt for northeastern iowa, and southeastern minnesota. 5/17/2017 6:59 PM CDT At 658 pm cdt, severe thunderstorms were located along a line extending from near austin to preston, moving north at 50 mph (radar indicated. spotters in spring valley reported 50 mph). Hazards include 70 mph wind gusts and quarter size hail. Hail damage to vehicles is expected. expect considerable tree damage. wind damage is also likely to mobile homes, roofs, and outbuildings. these severe storms will be near, brownsdale around 705 pm cdt. chatfield around 715 pm cdt. other locations impacted by these severe thunderstorms include fillmore, lansing, washington, racine and mayville. 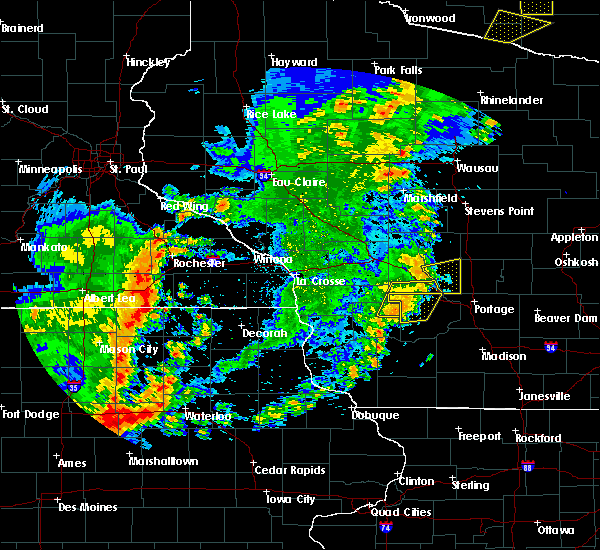 A tornado watch remains in effect until 1100 pm cdt for northeastern iowa, and southeastern minnesota. 5/17/2017 6:48 PM CDT At 647 pm cdt, severe thunderstorms were located along a line extending from near london to near harmony, moving north at 50 mph (radar indicated. 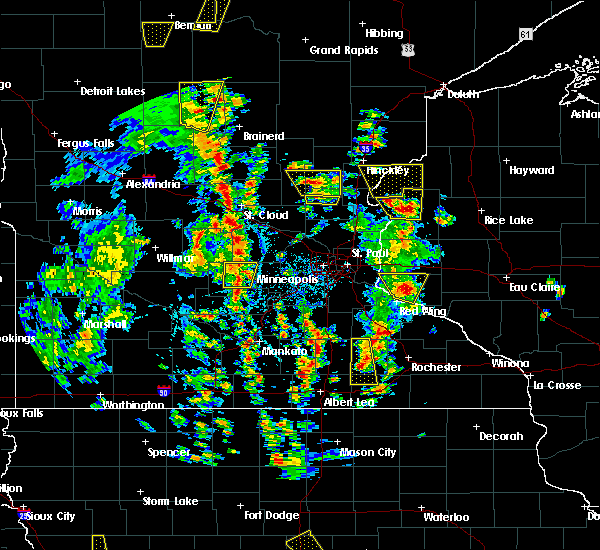 this cluster of storms has a history of producing damaging winds). Hazards include 70 mph wind gusts and quarter size hail. Hail damage to vehicles is expected. expect considerable tree damage. wind damage is also likely to mobile homes, roofs, and outbuildings. these severe storms will be near, rose creek around 650 pm cdt. preston, austin, fountain and ramsey around 700 pm cdt. brownsdale around 705 pm cdt. chatfield around 710 pm cdt. other locations impacted by these severe thunderstorms include fillmore, lansing, washington, racine and mayville. 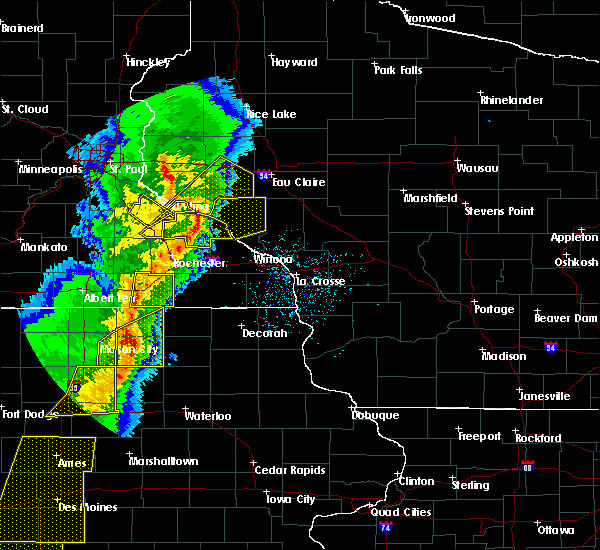 A tornado watch remains in effect until 1100 pm cdt for northeastern iowa, and southeastern minnesota. 5/17/2017 6:35 PM CDT At 635 pm cdt, severe thunderstorms were located along a line extending from near st. ansgar to near cresco, moving north at 50 mph (radar indicated. these storms have a history of producing damaging winds). Hazards include 60 mph wind gusts and quarter size hail. Hail damage to vehicles is expected. expect wind damage to roofs, siding, and trees. severe thunderstorms will be near, lyle around 645 pm cdt. rose creek around 650 pm cdt. preston around 655 pm cdt. austin, ramsey, fountain and brownsdale around 700 pm cdt. chatfield around 710 pm cdt. other locations impacted by these severe thunderstorms include fillmore, lansing, washington, racine and mayville. 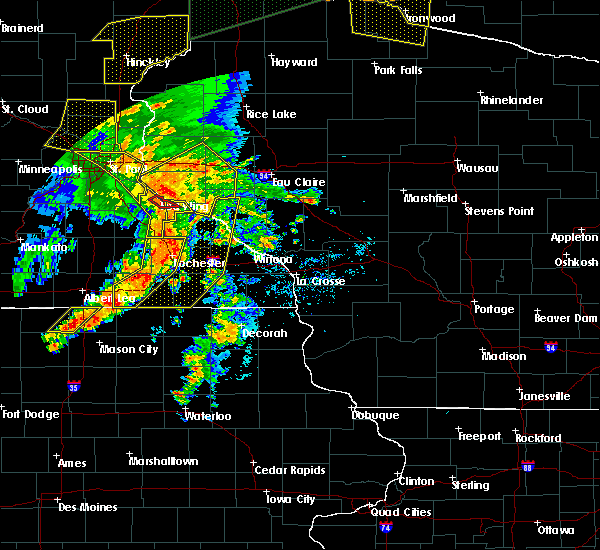 A tornado watch remains in effect until 1100 pm cdt for northeastern iowa, and southeastern minnesota. 4/9/2017 10:26 PM CDT At 1026 pm cdt, a severe thunderstorm was located near le roy, or 17 miles west of preston, moving northeast at 45 mph (radar indicated). Hazards include ping pong ball size hail. People and animals outdoors will be injured. expect damage to roofs, siding, windows, and vehicles. this severe storm will be near, spring valley around 1030 pm cdt. wykoff around 1040 pm cdt. preston, fountain and chatfield around 1050 pm cdt. lanesboro around 1055 pm cdt. rushford around 1100 pm cdt. Other locations impacted by this severe thunderstorm include fillmore, rushford village, washington, racine and cherry grove. 4/9/2017 10:15 PM CDT At 1015 pm cdt, a severe thunderstorm was located near le roy, or 22 miles west of preston, moving northeast at 55 mph (radar indicated). Hazards include ping pong ball size hail. People and animals outdoors will be injured. expect damage to roofs, siding, windows, and vehicles. this severe thunderstorm will be near, spring valley around 1025 pm cdt. wykoff around 1030 pm cdt. preston, fountain and chatfield around 1040 pm cdt. lanesboro around 1045 pm cdt. rushford around 1100 pm cdt. Other locations impacted by this severe thunderstorm include fillmore, rushford village, washington, racine and cherry grove. 4/9/2017 8:54 PM CDT The severe thunderstorm warning for central mower county will expire at 900 pm cdt, the storm which prompted the warning has moved out of the area. therefore the warning will be allowed to expire. 4/9/2017 8:35 PM CDT At 834 pm cdt, a severe thunderstorm was located 8 miles southeast of hayfield, or 16 miles northeast of austin, moving northeast at 40 mph (trained weather spotters reported quarter size hail in austin at 812 pm). Hazards include 60 mph wind gusts and quarter size hail. Hail damage to vehicles is expected. expect wind damage to roofs, siding, and trees. This severe thunderstorm will remain over mainly rural areas of central mower county, including the following locations: lansing, mayville, dexter, mapleview and waltham. 4/9/2017 8:24 PM CDT At 823 pm cdt, a severe thunderstorm was located over brownsdale, or 8 miles northeast of austin, moving northeast at 45 mph (trained weather spotters reported quarter size hail in austin). Hazards include 60 mph wind gusts and quarter size hail. Hail damage to vehicles is expected. expect wind damage to roofs, siding, and trees. 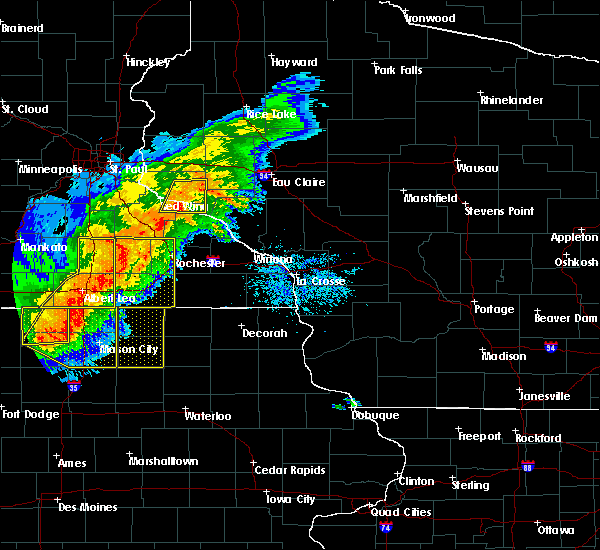 this severe storm will be near, grand meadow around 835 pm cdt. Other locations impacted by this severe thunderstorm include lansing, mayville, dexter, mapleview and waltham. 4/9/2017 8:13 PM CDT At 813 pm cdt, a severe thunderstorm was located over austin, moving northeast at 45 mph (radar indicated). Hazards include quarter size hail. Damage to vehicles is expected. this severe thunderstorm will be near, brownsdale around 825 pm cdt. grand meadow around 835 pm cdt. Other locations impacted by this severe thunderstorm include lansing, mayville, dexter, mapleview and waltham. 3/6/2017 6:57 PM CST At 657 pm cst, severe thunderstorms were located along a line extending from 8 miles northwest of grand meadow to near adams, moving northeast at 65 mph (radar indicated). Hazards include 60 mph wind gusts. Expect damage to roofs, siding, and trees. 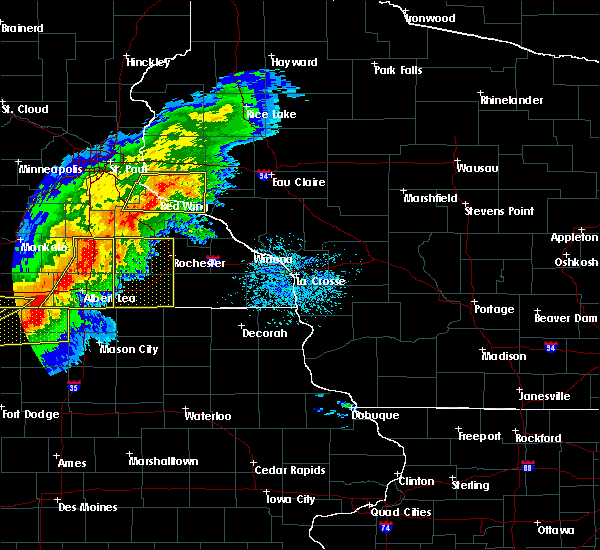 severe thunderstorms will be near, le roy around 705 pm cst. grand meadow around 715 pm cst. other locations impacted by these severe thunderstorms include racine, dexter, elkton, sargeant and taopi. A tornado watch remains in effect until 1000 pm cst for southeastern minnesota. 8/18/2016 5:26 PM CDT At 523 pm cdt, severe thunderstorms were located along a line extending from near hayfield to near grand meadow to adams, moving east at 35 mph (law enforcement reported 60 mph winds in hayfield at 523 pm). Hazards include 60 mph wind gusts. Expect damage to roofs. siding. and trees. 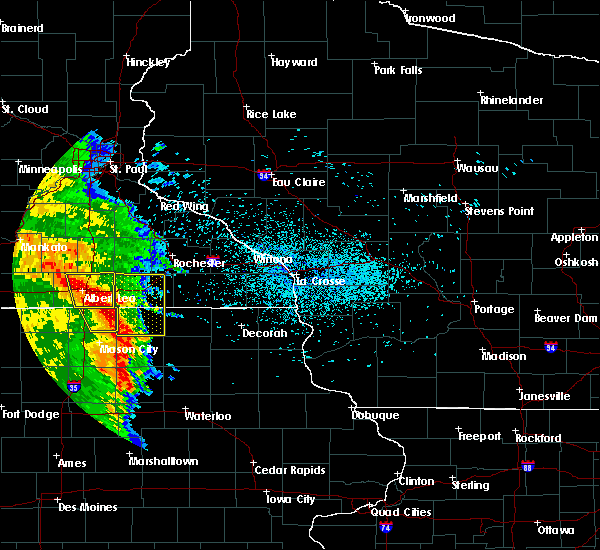 persons in the eastern portion of dodge county and southern mower county will be affected through 530 pm. the warning will then be allowed to expire at 530 pm as storms are shifting east. 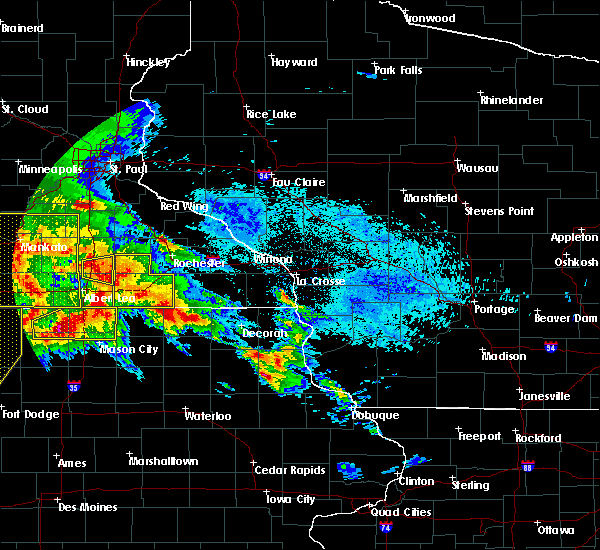 Storms will continue through 6 pm before moving out. 8/18/2016 5:13 PM CDT At 511 pm cdt, strong to severe thunderstorms were continuingtoaffect most of mower and dodge county, moving east at 35 mph (law enforcement reports some tree debris and wind gusts in the 50 mph range at hayfield at 510 pm). Hazards include 60 mph wind gusts and nickel size hail. Expect damage to roofs. siding. and trees. 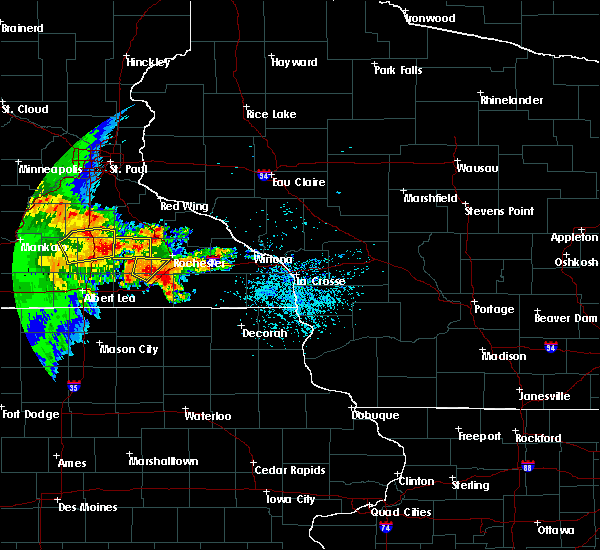 Storms will continune in the mower and dodge county area for another 30 minutes. 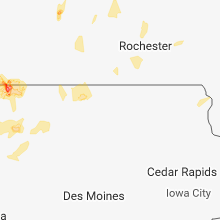 8/18/2016 5:02 PM CDT At 500 pm cdt, severe thunderstorms were located along a line extending from near dodge center to near brownsdale to near rose creek, moving east at 50 mph (law enforcement reports power line damage and some brances down in austin and the northwest portion of mower county). Hazards include 60 mph wind gusts and nickel size hail. Expect damage to roofs. siding. and trees. 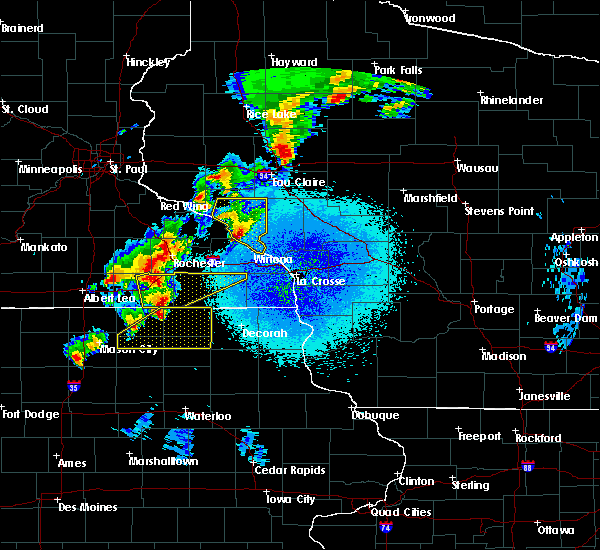 these severe storms will be near, adams around 510 pm cdt. 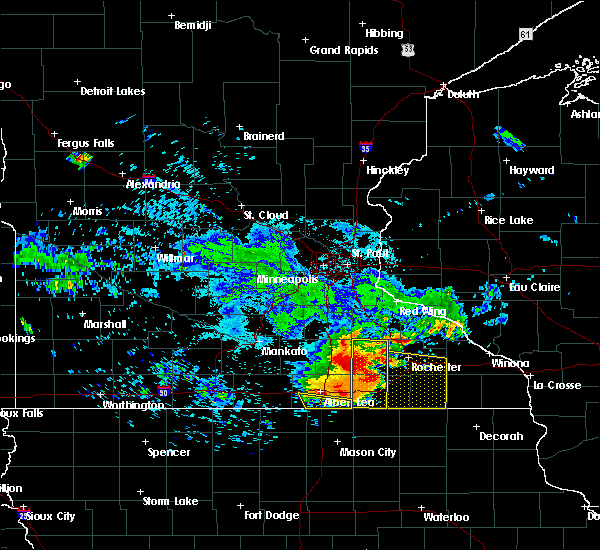 Other locations impacted by these severe thunderstorms include lansing, wasioja, concord, mayville and dexter. 8/18/2016 4:42 PM CDT At 439 pm cdt, severe thunderstorms were located along a line extending from near claremont to near hayward, moving east at 45 mph (public. this storm has a history of winds to 60 mph and wind damage). Hazards include 60 mph wind gusts and nickel size hail. Expect damage to roofs. siding. and trees. these severe storms will be near, claremont around 445 pm cdt. west concord around 450 pm cdt. dodge center and hayfield around 455 pm cdt. 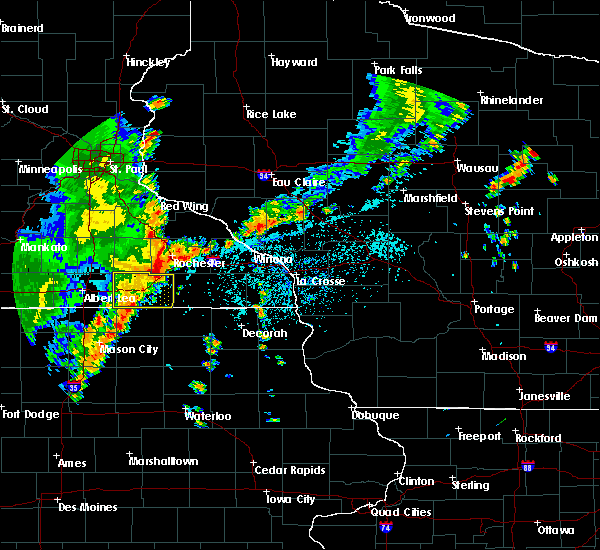 austin, mantorville, kasson and ramsey around 500 pm cdt. brownsdale and lyle around 505 pm cdt. rose creek around 510 pm cdt. adams around 520 pm cdt. 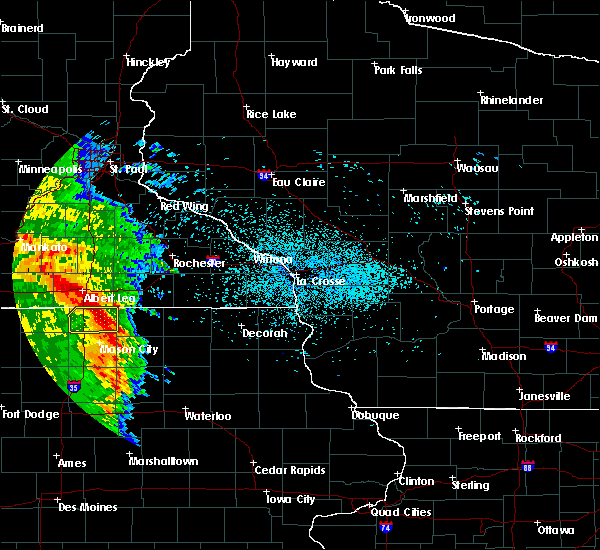 Radar indicates that the strongest winds could be in far southern dodge and northern mower county. 8/18/2016 4:29 PM CDT At 425 pm cdt, severe thunderstorms were located along a line extending from owatonna to near albert lea, moving east at 35 mph (law enforcement. 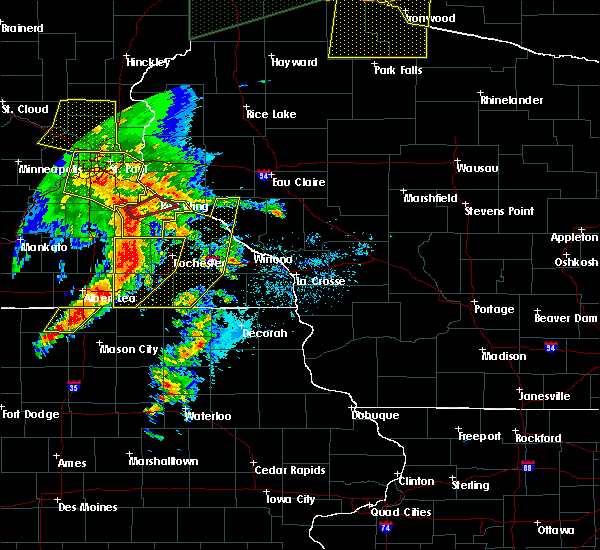 these storms have produced 50 to 60 mph winds near waseca and also wind damage). Hazards include 60 mph wind gusts and nickel size hail. Expect damage to roofs. siding. and trees. severe thunderstorms will be near, claremont around 445 pm cdt. west concord around 450 pm cdt. 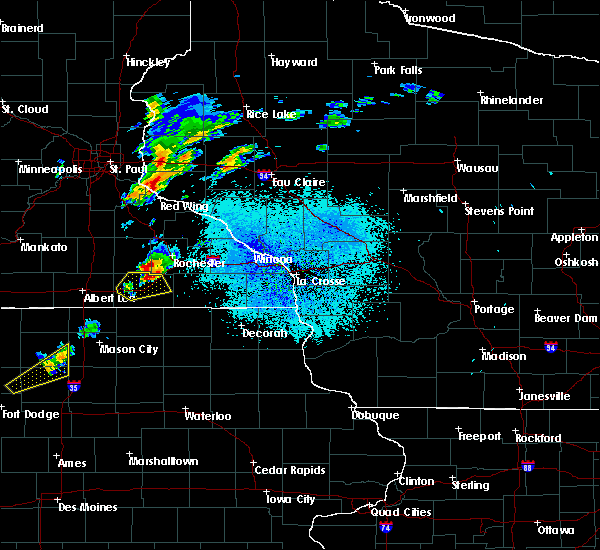 dodge center around 455 pm cdt. mantorville, ramsey and hayfield around 500 pm cdt. austin and lyle and brownsdale around 510 pm cdt. Adams around 525 pm cdt. 7/17/2016 12:38 AM CDT At 1237 am cdt, severe thunderstorms were located along a line extending from 8 miles east of brownsdale to near lyle, moving east at 45 mph (radar indicated). Hazards include 60 mph wind gusts and quarter size hail. Hail damage to vehicles is expected. expect wind damage to roofs, siding, and trees. 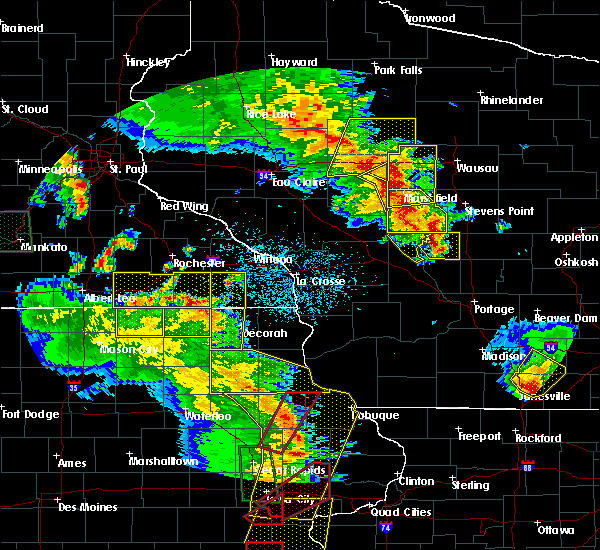 these severe storms will be near, grand meadow and adams around 1250 am cdt. le roy around 100 am cdt. riceville around 105 am cdt. Other locations impacted by these severe thunderstorms include lansing, racine, mayville, dexter and mapleview. 7/17/2016 12:16 AM CDT At 1216 am cdt, severe thunderstorms were located along a line extending from near blooming prairie to near glenville, moving east at 45 mph (radar indicated). Hazards include 60 mph wind gusts and quarter size hail. Hail damage to vehicles is expected. expect wind damage to roofs, siding, and trees. severe thunderstorms will be near, austin and ramsey around 1220 am cdt. brownsdale around 1225 am cdt. lyle around 1230 am cdt. 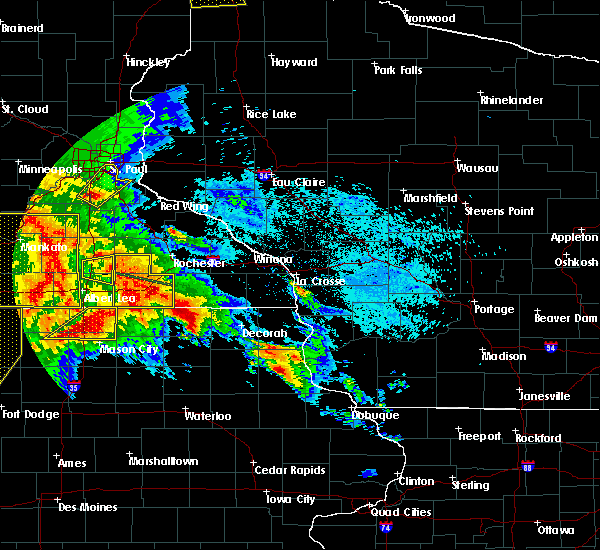 st. ansgar and rose creek around 1235 am cdt. 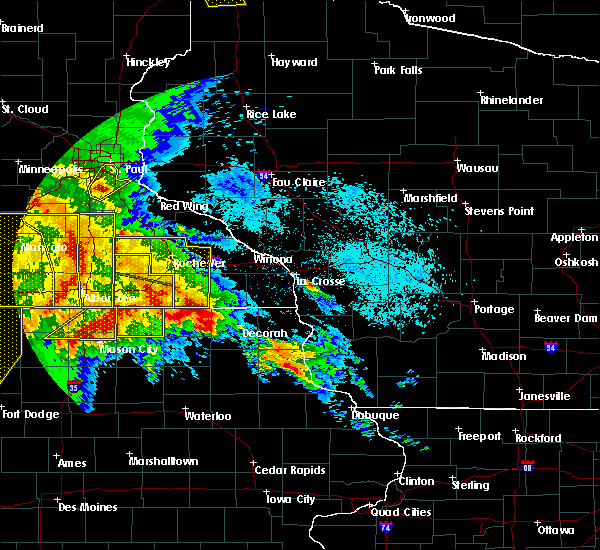 grand meadow, stacyville and adams around 1245 am cdt. le roy around 1255 am cdt. riceville around 100 am cdt. Other locations impacted by these severe thunderstorms include lansing, racine, mayville, dexter and mapleview. 7/7/2016 3:21 AM CDT At 320 am cdt, severe thunderstorms were located along a line extending from brownsdale to near le roy to near elma, moving northeast at 50 mph (radar indicated). Hazards include 60 mph wind gusts and penny size hail. Expect damage to roofs. siding. and trees. 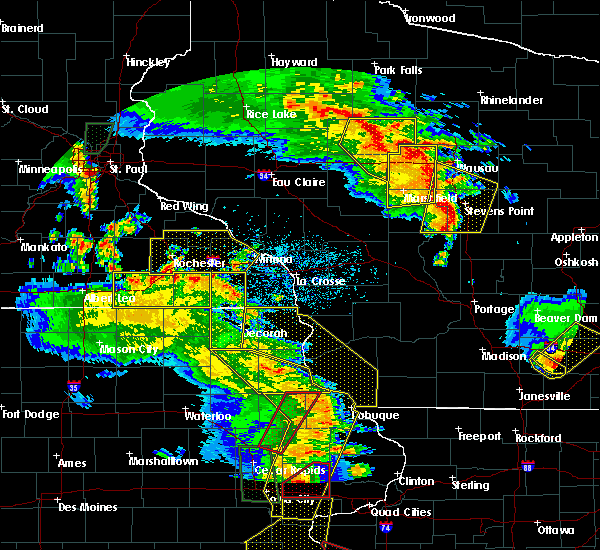 these severe storms will be near, grand meadow around 330 am cdt. Other locations impacted by these severe thunderstorms include lansing, mayville, dexter, waltham and elkton. 7/7/2016 3:15 AM CDT At 314 am cdt, severe thunderstorms were located along a line extending from ramsey to near stacyville to 8 miles northeast of floyd, moving northeast at 50 mph (radar indicated). Hazards include 60 mph wind gusts and penny size hail. Expect damage to roofs. siding. and trees. 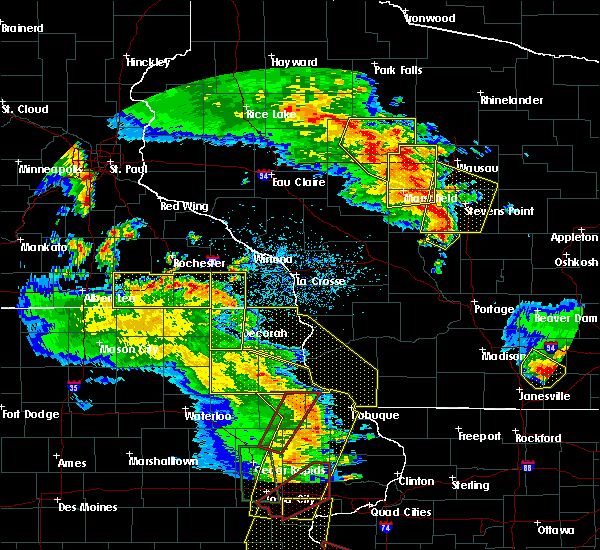 these severe storms will be near, riceville around 325 am cdt. 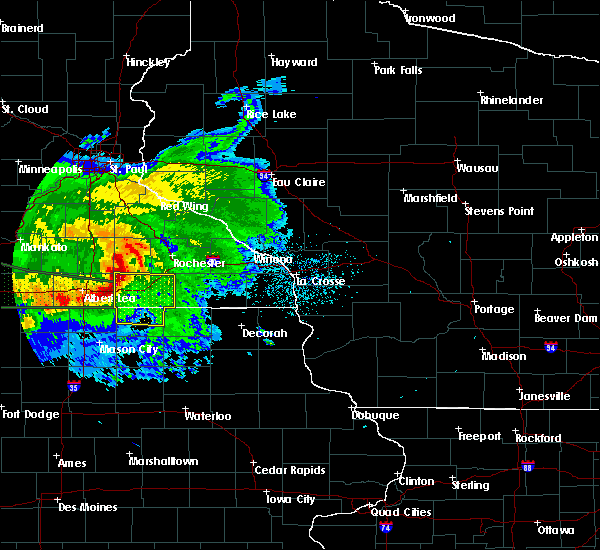 grand meadow around 330 am cdt. Other locations impacted by these severe thunderstorms include lansing, mayville, dexter, mapleview and waltham. 7/7/2016 3:03 AM CDT At 302 am cdt, severe thunderstorms were located along a line extending from near hayward to near st. ansgar to near floyd, moving northeast at 45 mph (radar indicated). Hazards include 60 mph wind gusts and penny size hail. Expect damage to roofs. siding. and trees. these severe storms will be near, stacyville around 310 am cdt. brownsdale, adams and rose creek around 320 am cdt. riceville around 325 am cdt. 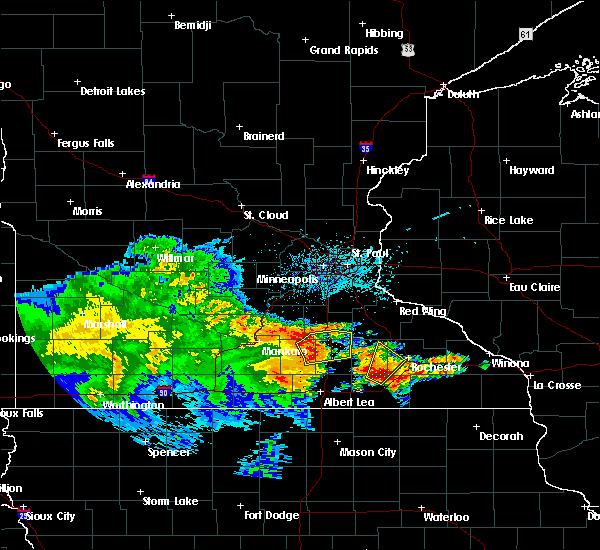 grand meadow around 330 am cdt. Other locations impacted by these severe thunderstorms include lansing, mayville, dexter, mapleview and waltham. 7/7/2016 2:50 AM CDT At 250 am cdt, severe thunderstorms were located along a line extending from glenville to 7 miles southeast of northwood to nora springs, moving east at 45 mph (radar indicated). Hazards include 60 mph wind gusts. Expect damage to roofs. siding. and trees. 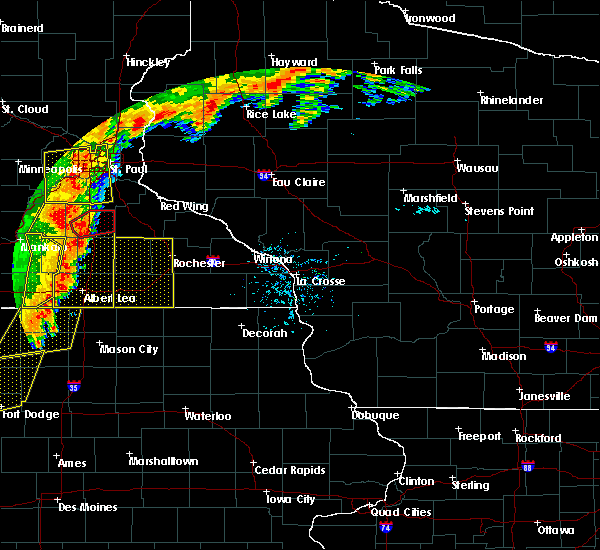 severe thunderstorms will be near, st. ansgar around 300 am cdt. osage around 305 am cdt. ramsey and lyle around 310 am cdt. austin and stacyville around 315 am cdt. rose creek and brownsdale around 320 am cdt. adams and riceville around 325 am cdt. grand meadow around 330 am cdt. Other locations impacted by these severe thunderstorms include lansing, mayville, dexter, mapleview and waltham. 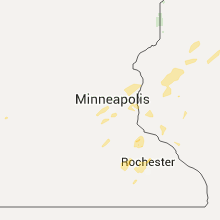 6/22/2015 7:05 AM CDT At 705 am cdt, severe thunderstorms were located along a line extending from near mantorville to 6 miles north of grand meadow to adams, moving southeast at 55 mph (radar indicated). Hazards include 60 mph wind gusts. Expect damage to roofs. siding and trees. 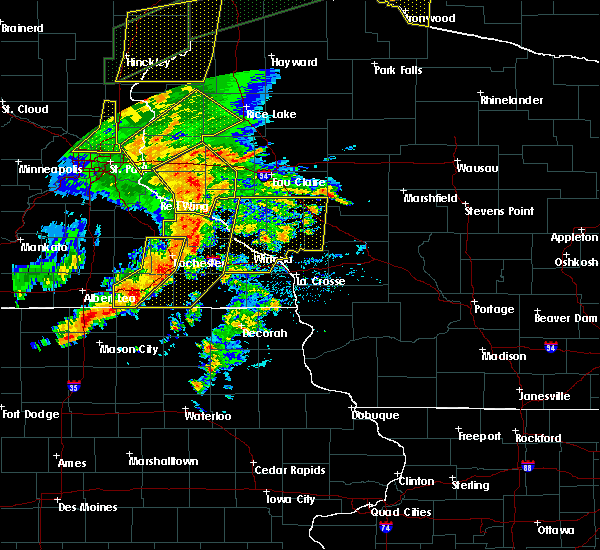 these severe storms will be near, grand meadow and stewartville around 710 am cdt. spring valley, rochester and le roy around 715 am cdt. wykoff around 720 am cdt. eyota and fountain around 725 am cdt. preston and dover around 730 am cdt. chatfield around 735 am cdt. Other locations impacted by these severe thunderstorms include ramsey, fillmore, marion, high forest and lansing. 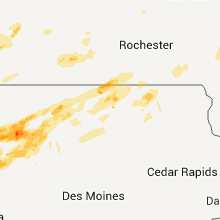 6/22/2015 6:42 AM CDT At 640 am cdt, severe thunderstorms were located along a line extending from 7 miles southwest of faribault to 10 miles west of blooming prairie to albert lea, moving east at 50 mph (radar indicated). Hazards include 60 mph wind gusts. Expect damage to roofs. siding and trees. 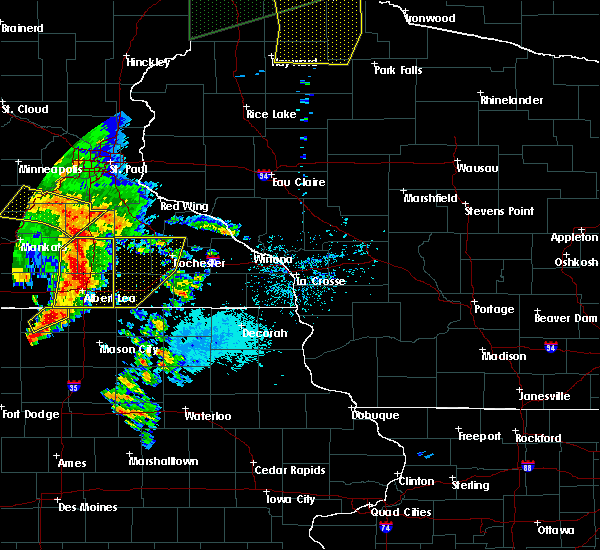 severe thunderstorms will be near, blooming prairie around 650 am cdt. claremont around 700 am cdt. dodge center, austin and west concord around 705 am cdt. brownsdale around 710 am cdt. 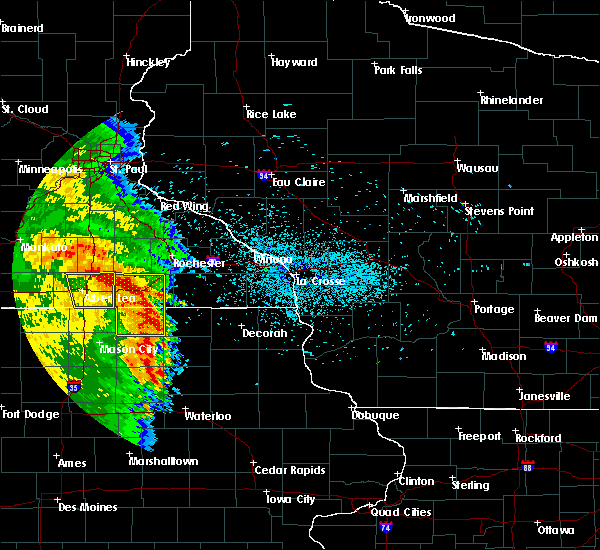 mantorville, kasson and hayfield around 715 am cdt. byron and pine island around 720 am cdt. 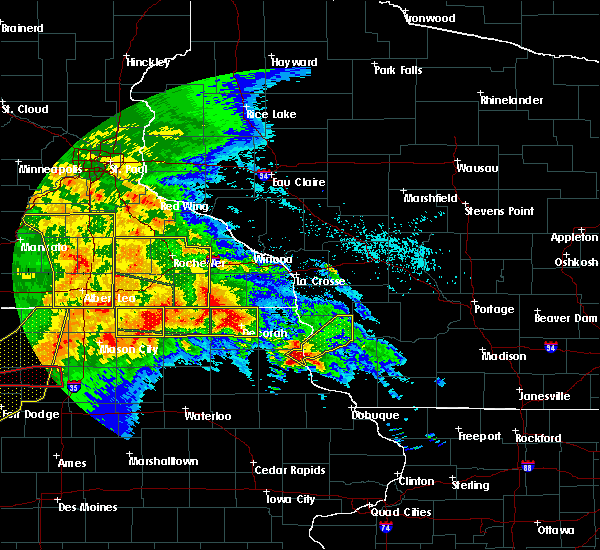 rochester and grand meadow around 725 am cdt. oronoco around 730 am cdt. 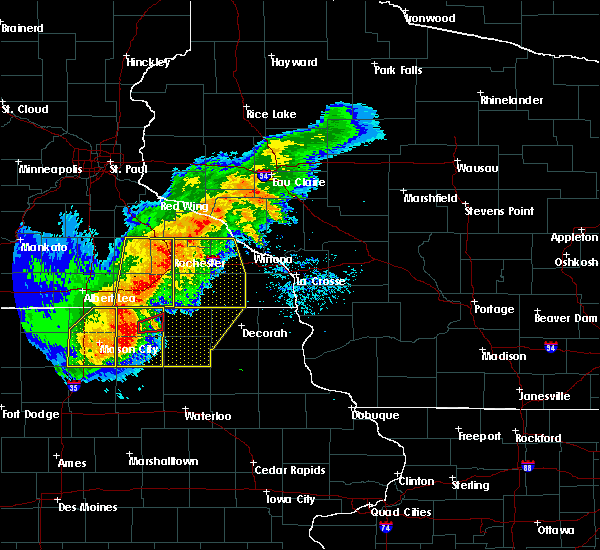 this warning replaces the previous severe thunderstorm warning for parts of mower and dodge counties. Strong winds can be expected behind these storms as well so be alert for that. 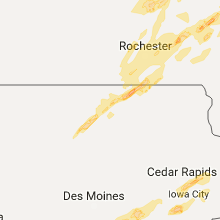 6/22/2015 6:29 AM CDT At 628 am cdt, severe thunderstorms were located along a line extending from near dodge center to near spring valley, moving northeast at 20 mph. but another line of storms with strong wind gusts was approaching behind this and will sweep into the area before 715 am (radar indicated). Hazards include 60 mph wind gusts. Expect damage to roofs. siding and trees. 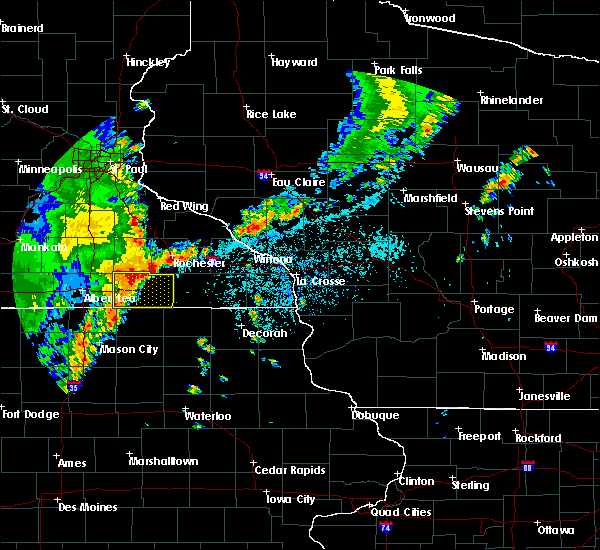 these severe storms will be near, kasson around 645 am cdt. Other locations impacted by these severe thunderstorms include ramsey, lansing, racine, mayville and dexter. 6/22/2015 6:12 AM CDT At 610 am cdt, a severe thunderstorm was located near adams, or 13 miles east of austin, moving northeast at 30 mph. other strong to severe storms were crossing interstate 35 with more storms coming towards the area from the west (radar indicated). Hazards include 60 mph wind gusts and nickel size hail. Expect damage to trees or power lines. this severe storm will be near, hayfield around 615 am cdt. grand meadow around 625 am cdt. Other locations impacted by this severe thunderstorm include ramsey, lansing, racine, mayville and dexter. 6/22/2015 5:49 AM CDT At 546 am cdt, a severe thunderstorm was located near rose creek, or near austin, moving east at 25 mph. other severe thunderstorms were crossing interstate 35 and will approach hayfield (radar indicated). Hazards include 60 mph wind gusts and half dollar size hail. Hail damage to vehicles is expected. expect wind damage to roofs, siding and trees. these severe thunderstorms will be near, rose creek and brownsdale around 600 am cdt. adams and hayfield around 610 am cdt. le roy around 630 am cdt. grand meadow around 635 am cdt. other locations impacted by this severe thunderstorm include ramsey, lansing, racine, mayville and dexter. Other thunderstorms will approach from the west in the next hour or so with stronger wind gusts potentially. 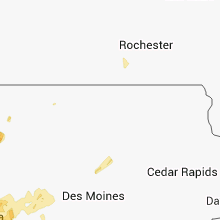 5/3/2015 7:37 PM CDT The severe thunderstorm warning for northwestern mower and southern dodge counties will expire at 745 pm cdt, the storm which prompted the warning has moved out of the area. therefore the warning will be allowed to expire. 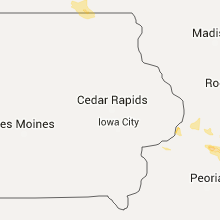 5/3/2015 7:10 PM CDT At 709 pm cdt, a severe thunderstorm was located 7 miles west of stewartville, or 13 miles south of byron, and is nearly stationary (trained weather spotters). Hazards include ping pong ball size hail was reported by spotters in hayfield at 655 pm cdt. People and animals outdoors will be injured. expect damage to roofs, siding, windows and vehicles. locations impacted include, hayfield, brownsdale, blooming prairie, lansing, mayville, dexter, oslo, waltham, sargeant, county roads 1 and 15, highway 30 and county 3, renova, interstate 90 and county 1 and brookside campground. 1. 50in. 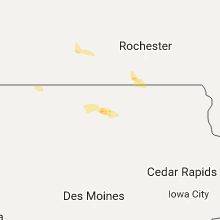 5/3/2015 7:04 PM CDT At 703 pm cdt, a severe thunderstorm was located 7 miles southeast of hayfield, or 13 miles south of byron, and is nearly stationary (trained weather spotters). Hazards include ping pong ball size hail was reported by spotters in hayfield at 655 pm cdt. People and animals outdoors will be injured. expect damage to roofs, siding, windows and vehicles. locations impacted include, hayfield, brownsdale, blooming prairie, lansing, mayville, dexter, oslo, waltham, sargeant, county roads 1 and 15, highway 30 and county 3, renova, interstate 90 and county 1 and brookside campground. 1. 50in. 5/3/2015 6:55 PM CDT At 655 pm cdt, a severe thunderstorm was located near hayfield, or 12 miles northeast of austin, moving east at 40 mph (radar indicated). Hazards include half dollar size hail. Damage to vehicles is expected. this severe thunderstorm will remain over mainly rural areas of northwestern mower and southern dodge counties, including the following locations, lansing, mayville, dexter, oslo and waltham. 1. 25in. 5/3/2015 6:51 PM CDT At 651 pm cdt, a severe thunderstorm was located near hayfield, or 11 miles north of austin, moving east at 40 mph (radar indicated). Hazards include half dollar size hail. Damage to vehicles is expected. this severe storm will be near, hayfield around 655 pm cdt. other locations impacted by this severe thunderstorm include lansing, mayville, dexter, oslo and waltham. 1. 25in. 5/3/2015 6:41 PM CDT At 640 pm cdt, a severe thunderstorm was located near blooming prairie, or 12 miles northwest of austin, moving east at 25 mph (radar indicated). Hazards include half dollar size hail. Damage to vehicles is expected. 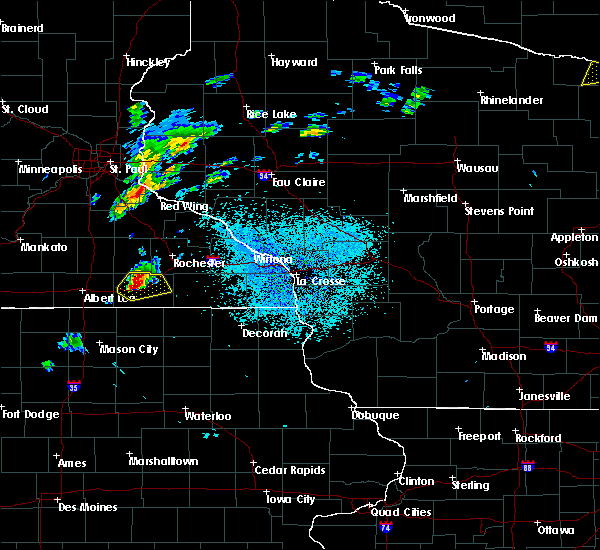 this severe thunderstorm will be near, blooming prairie around 650 pm cdt. brownsdale and hayfield around 710 pm cdt. other locations impacted by this severe thunderstorm include lansing, mayville, dexter, oslo and waltham. 1. 25in. 4/7/2015 3:15 PM CDT The national weather service in la crosse has issued a * severe thunderstorm warning for. 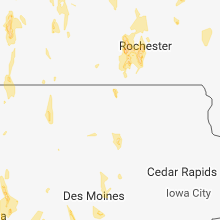 north central mower county in southeastern minnesota. 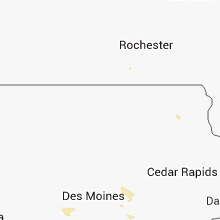 southeastern dodge county in southeastern minnesota. until 345 pm cdt * at 314 pm cdt. A severe thunderstorm was located near waltham. 4/7/2015 3:04 PM CDT A severe thunderstorm warning remains in effect until 315 pm cdt for northern mower county. at 303 pm cdt. a severe thunderstorm was located just north of austin. moving northeast at 40 mph. this was a new storm that now has signs of hail. hazard. Quarter size hail. 4/7/2015 2:53 PM CDT A severe thunderstorm warning remains in effect until 315 pm cdt for northern mower county. at 251 pm cdt. a severe thunderstorm was located near brownsdale. or 11 miles northeast of austin. moving northeast at 45 mph. hazard. quarter size hail. source. Radar indicated. 4/7/2015 2:45 PM CDT The national weather service in la crosse has issued a * severe thunderstorm warning for. 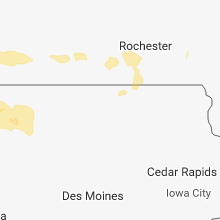 northern mower county in southeastern minnesota. until 315 pm cdt * at 244 pm cdt. a severe thunderstorm was located over brownsdale. or 7 miles east of austin. Moving northeast at 45. 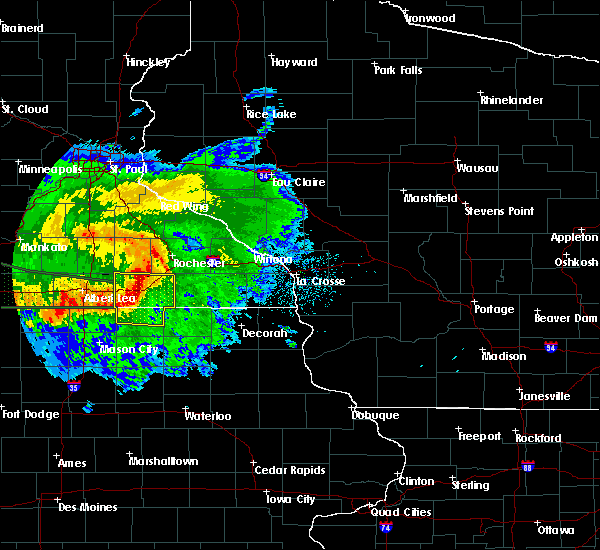 5/7/2014 7:15 AM CDT Golf Ball sized hail reported 2.3 miles S of Sargeant, MN, delayed report. time estimated via radar.